How do Italy follow 2015, which ended with a best-ever third place finish? Sara Barattin is under no illusions about the challenge ahead of her as the new captain of the Italy. With Sylvia Gaudino taking a year out, Sara has the unenviable task of following on from a remarkable 2015 that saw Italy win three out of five games, including a second win in three years against France and a dominant performance to beat their World Cup qualification rivals Wales. “It will be much tougher this year”, she told us, “as now the other teams will be ready for us”. The fixtures are also tougher this year, with France, Ireland and Wales all away, and England and Scotland at home. Italy won in Bridgend in 2010, but apart from that tight 19-15 triumph they have never won on the road in the Six Nations, except in Scotland. In addition the Italians were unable to arrange any practice fixtures this year. But history counts for little with this confident Azurri team, and Barattin is particularly relishing the visit of England in round two – “If we play well we can win”. 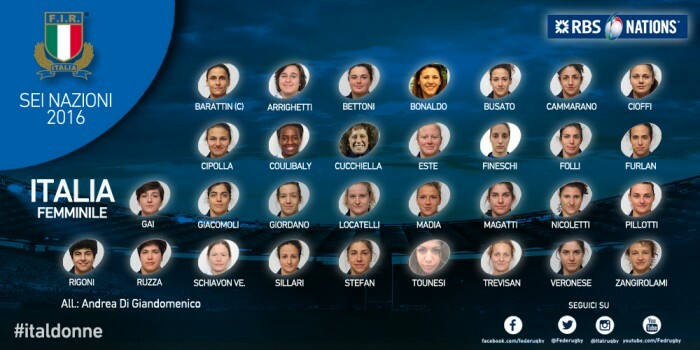 Italy have had a very settled squad in recent years but this year the squad for the opening two weeks includes four uncapped players – fly half Silvia Folli, props Gaia Giacomoli and Diletta Nicoletti, and second row Elisa Pillotti.